If you want clean, pure, and refreshing drinking water on command, a reverse osmosis system can deliver it to you. These systems work by removing almost all of the contaminants from your water, ridding it of minerals, chemicals, and bacteria. Curious as to how exactly a Glen Ellyn reverse osmosis systems work? Looking for a little more information? Read on. This article has you covered. The housing is the external shell of the reverse osmosis system. This component is essentially the skeleton of the system, ensuring that all of the internal components remain in the correct place. Reverse osmosis systems consist of three valves: feed, automatic shut-off, and drain valves. The feed valve connects to the water supply and allows water to come into the RO system. The automatic shut-off valve is in place to prevent the RO system storage tank from overflowing. It engages when the storage tank is full, conserving both water and energy. The drain valve is used to dispose of any water that has cycled through the system, but was not cleansed of contaminants. The first filter that water will meet when going through a RO system is the pre-filter. The pre-filter is responsible for filtering large contaminants such as dirt, sand, and sediment. At the center of the reverse osmosis system is the membrane. This component filters out the vast majority of contaminants contained within the water — typically around 95% of them. Reverse osmosis systems typically also have a post-filter. This filter is the fail-safe of the system, catching any contaminants that might have slipped through the pre-filter and membrane. After water has been cleared of contaminants, it will be dumped into the storage tank. The water contained in the storage tank is ready for consumption. The faucet is the component of the reverse osmosis system that connects it to the outside world. It is the implement that distributes clean, purified water to the rest of your home. While different reverse osmosis systems come with different numbers of filtration levels, most can be accurately broken down into three levels. These levels include pre-filtering, membrane filtering, and post-filtering. The pre-filtering level of filtration is fairly basic. At this level, the reverse osmosis system will rid your water of large contaminants like dirt, sediment, and sand. If you use municipal water, this level of filtration won’t do much to treat your water. However, if you get your water from a well, it can make a huge difference. As noted above, the membrane filtering level is where most of the work is done. At this level, all types of contaminants are removed from your water, including minerals, bacteria, chemicals, and more. Some of the substances that will be removed include arsenic, calcium, magnesium, lead, and mercury. At the post-filtering level, the reverse osmosis system will attempt to remove any contaminants that were not removed previously. While it will not remove all of the contaminants left in your water, it will remove the vast majority of them. 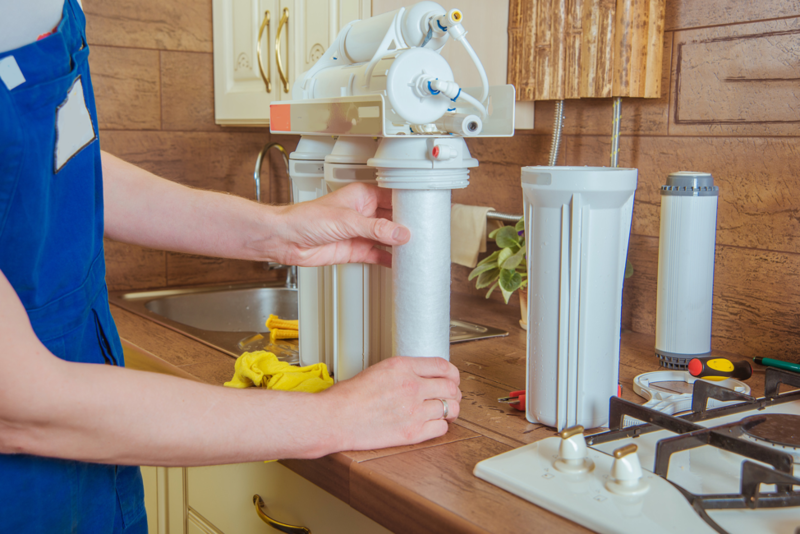 Looking for a Reverse Osmosis System in Glen Ellyn, Illinois? Now that you’ve learned about how reverse osmosis systems work, you might be interested in installing one. If so, and if you’re looking for a reverse osmosis system in Glen Ellyn, Johnson Water Conditioning is the company to call. Our team of expert water conditioning specialists is well-versed in the installation of reverse osmosis systems. Whatever your filtration needs may be, we can help you.